Before moving to Texas, I’d rarely encountered cockroaches. Here, they are common. And although I have no love for the creatures, I do have a grudging respect for their tenacity. Any observer will tell you they are built to survive: lightning fast, adept hiders… their bodies protected by a thick exoskeleton. A quick Google search tells me cockroaches can withstand ice burial, radiation, and even (for a time) decapitation. They can go up to 45 minutes without air, can survive prolonged submersion in water, and are able to live on nothing more than hair, soap, glue. And yet, despite all these qualities, this “indestructible” creature is undone by one strange flaw. One morning, while trying to kill a cockroach, it fell to the floor on its back. To my surprise, it could not right itself. It simply flailed its feet like some tiny, upturned turtle. 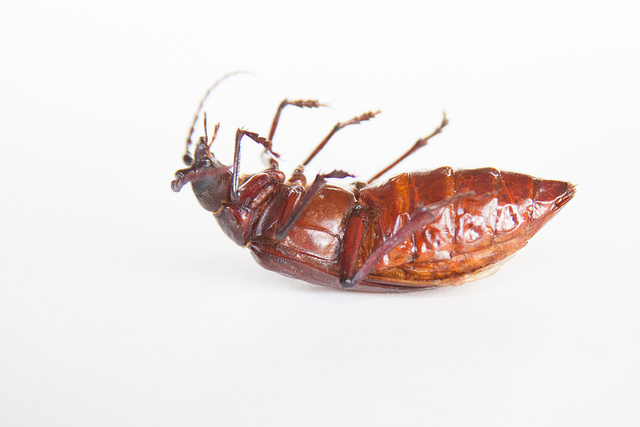 I thought it a fluke… it’s predicament due to some damage to its legs or body, but I’ve since seen the phenomenon repeated: otherwise-mighty roaches lying upturned on the floor, legs flailing in helpless impotence. Despite all their strengths and advantages, they are entirely undone by this one absurd weakness. As with cockroaches, so with men. You have the knowledge, you have the tools. On paper, you are the ultimate life form. On paper, you should be unstoppable. But like the mighty roach, you are too easily laid low, your potential unrealized on account of your chief weakness. In short, it does not matter how good you are. If you have a flaw that is crippling, none of it matters. It is all swallowed up in the sabotage. To create the life you desire, you must get clear on your ruinous weakness. And you must go deeper than “I procrastinate” or “I’m lazy.” Find the subterranean WHY beneath the easy labels… the electrical short deep in your circuitry. Your crippling flaw could be an over-developed self-reliance that leads you to work your projects alone and unsupported. It could be a childhood belief that money is a corrupting force rather than a liberating one, leading you to sabotage your money-accumulating efforts unaware. It could be an intolerance for failure, your ego unable to withstand your own self-judgement, leading you to choose only safe, predictable paths leading nowhere new. It could be a crushing sense of inferiority that leads you to shirk any mantle of leadership, to avoid any action implying you are wise, or worthy of anyone’s respect or attention. Whatever it is, you must look with clear eyes upon the flailing legs and choose a new form. You must recognize that, unlike with the roach, your crippling weakness is ephemeral: it is not a physical deformity but a mental pattern. As such, it can be eliminated and upgraded instantaneously, with a new choice and the discipline to hold that choice to the fire until a new reality emerges. So purge the crippling belief. Rip out the over-protective exoskeleton. Rid yourself of the behavior that’s paralyzing your progress. Only then will this potential inside you finally translate to a better life. Only then will your seeds of greatness bear fruit.